Speaking to reporters in Washington, DNC Chairman Tim Kaine acknowledged that midterm elections are typically unkind to the party in power. “We’re running into a headwind, running uphill,” he said at a breakfast sponsored by the Christian Science Monitor. The former Virginia governor touted a new feature on the DNC web site, where viewers can type in their zip code and see “the real effects of the steps President Obama and Democrats have taken to rebuild our economy” in their own congressional district. Brushing aside concerns over the impact of the Tea Party movement, Kaine attempted to turn the conservative energy that dominated many Republican primaries this year into a positive for his party. He ticked off races in Delaware, Kentucky, Nevada and Alaska as examples where Democrats facing opponents with Tea Party support are faring better than they might have otherwise. 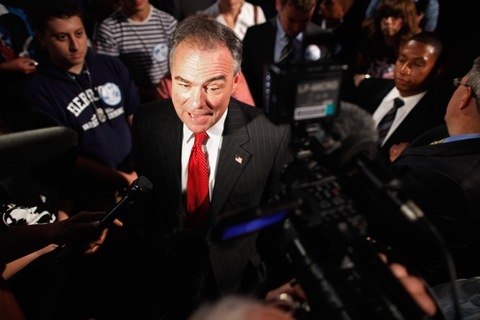 “We are going to win seats we would have lost six months ago because of the Tea Party,” Kaine said. Kaine faced several questions about the recent focus by Democrats on undisclosed campaign contributions as a salient political strategy. When asked if it was fair to say the public wasn’t focused on third-party expenditures right now, Kaine disagreed. “I think this a big story,” he said, citing a recent Bloomberg poll that found 47 percent of likely voters were less likely to support a candidate whose campaign ran ads funded by anonymous business groups. (Forty-one percent said it would not matter.) He said the topic of undisclosed donations resonates with Americans because it “ties in to one of our themes” — the economy. Chairman Kaine doesn’t expect the attacks on Republican groups like American Crossroads and the Chamber of Commerce to go away anytime soon. Democrats are “very serious about this issue of the Chamber,” he said. President Obama and other Democratic Party leaders have suggested publicly that the group has included foreign money in their campaign donations, a charge that has not been proven and the Chamber of Commerce denies. “The part I most don’t like is, you know, the fixing what’s bad about Obamacare. He had two very good Democratic Senators who voted for that bill, and they voted for it because it probably has as much to offer the residents of West Virginia as virtually any other state, if you look at health stats and stuff like that,” he added.